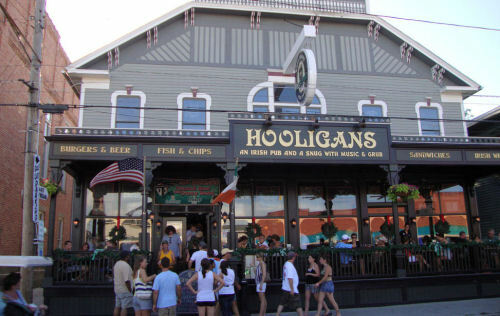 At Hooligan’s our friendly staff is well-trained and anxious to serve up a heaping plate of Irish hospitality. We bring the fundamental style of a true public house back to Put-in-Bay, Ohio by adding our own modern flare. With an exciting and distinguishing bar, we combine the pleasure of a refreshing pint with our warm and traditional Irish atmosphere. By simply walking into our quaintly designed vintage space, you will feel the inspiration drawn from the magic of the Emerald Isle. Our unsurpassed service, sparkling facility, and hospitable services will provide you with the Irish tradition you have been thirsting to experience! Knock down a Pint of Plain and add one more memorable experience to your day at Put-in-Bay, our own Emerald Isle! We look forward to serving you soon and providing you with the opportunity to enjoy a bit of Irish Hooley!